Sometimes, making home improvements and repairs can make owners feel like they are spending money without getting anything back. However, if you were one of the thousands of Anchorage homeowners who participated in the Alaska Home Energy Rebate program, home improvements have extra value. An analysis of the program recently shared at the Energy Efficiency NOW 2017 conference in Anchorage showed those who participated in the rebate program should get more than monthly energy savings for their participation. Here are a few thoughts on why and how to make certain the improvements are acknowledged. First, let's put things into perspective. In Alaska, household energy costs about $2,800 annually, which is 30 percent more than the national average. In 2014, Alaska ranked as the fourth-highest state for total energy consumed per capita, according to the U.S. Energy Information Administration. Only Louisiana, Wyoming and North Dakota residents spent more. The good news is about a third of Anchorage homes participated in the rebate program, which ended last year. This created a sizeable database of pre- and post-evaluations to use for comparison. 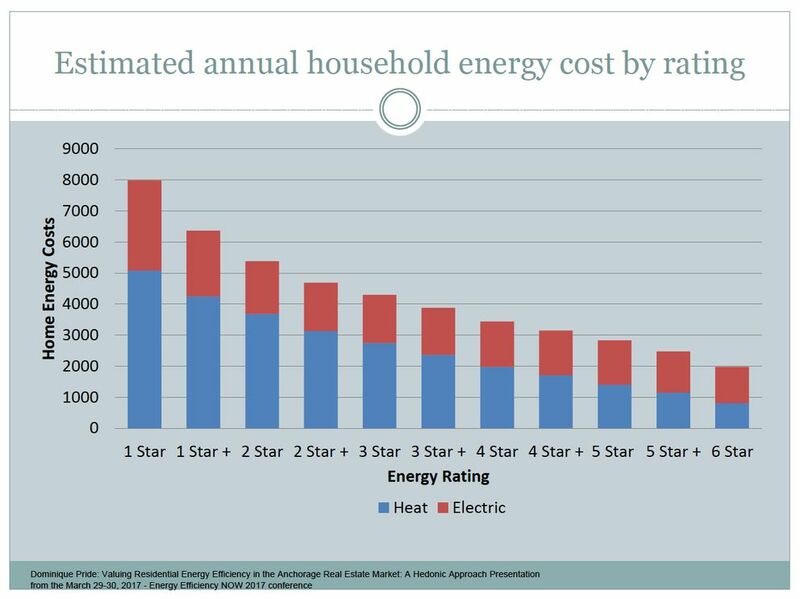 Attached to the pre- and post-STAR energy rating reports were annually projected heat and electric costs. This extensive database makes it easier to gauge project success in a multitude of ways. The first is added comfort. With each change in the home's post-evaluation STAR rating, there was an increase in the home's comfort. Heat was more evenly distributed with new mechanical systems. Caulking, weatherization and additional insulation decreased air leakage and cold spots. The overall comfort of the home increased for the occupants. Since more than 70 percent of a household's energy is used to heat the living space, the rebate and weatherization programs allowed occupants to continue to save money long after the work was completed. 1) Make certain to fill out your annual utility costs on the state of Alaska property disclosure statement. This document is required whenever a property is sold. While energy consumption varies based on occupants' use and energy habits, the document allows a buyer to compare utility costs of competing properties. The attached graph shows the differences in utility costs between the STAR levels. Many upgrades may not be evident until energy savings are compared to another home with a lower STAR rating. The comparison should increase the value of your home. 2) As the homeowner, make certain your energy rating and a complete list of improvements and costs performed during your ownership are prominently displayed in the marketing materials. Consider this information as important as a picture of the house and place it where prospective buyers can see it. If you or your real estate agent have made the lender aware of the improvements and energy efficiencies, this information should get passed on to the appraiser. However, make certain to leave a copy of the information at the house for the appraiser to take. — Calculating the present value of energy savings during a typical homeownership. — Calculating the value of the improvements, while adjusting for depreciation over time. The lender's role in the process is two-fold. Depending on the loan program, a lender may be able to slightly increase the buyer's loan amount by accounting for the STAR-rated energy savings. This could enable a buyer to purchase a slightly more expensive property with the documented efficiencies. Additionally, if the sale falls under Fannie Mae, Freddie Mac and FHA guidelines, the lender must make certain the appraiser is qualified in the valuation of energy efficient properties. So — you did all that work improving your home's energy efficiency; now make certain the work is reflected in your home's value when you sell.